89% of purchases start through a search engine. As your customer’s starting point, search engines are your opportunity to get more sales. With PPC ads, you can bring visitors to your website, to encourage them to buy and increase your profits. Hungry for success? There are a number of hidden tools that can maximise your results. Tools that make your ad more targeted, successful and profitable. Tools that increase your clicks and sales – all while bringing down your ROI (Return On Investment). And that’s what you want. To make more money from your Ads. The key to this is making sure that your ads are ultra-targeted to your customers. That will only run when your customers are online. When they’re likely to see them. Time-limited and GEO-targeted Google Ads do this. So, let’s find out exactly what they are and how you can use this to your advantage. What Are Time-Limited And Geo-Targeted Ads? Time-limited ads are ads scheduled to only run in certain hours. For example, these could be ads that only appear on Google between 8pm-2am Friday to Sunday. Time-limiting allows you to target your ads around the times that work for your business. So, you can stop throwing money away on times that your customers can’t visit or contact you. 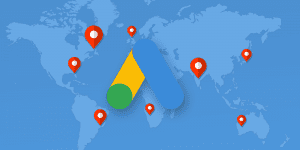 GEO-targeted Google Ads work in a similar way. Except instead of time, they make sure your ads are only shown to people within a certain geographical location. This location can be as big or little as you want it. You can restrict it down to a small district or village, or open it up to a whole region, country or even continent. If your customers are only online during certain hours, then limit your ads to those hours. For example, if you’ve got a B2B service, your ideal customers are more likely to convert between 8am-6pm Monday to Friday. This makes a pretty safe time-limited campaign. After all, it’s highly unlikely that you’ll get a boom in sales at 3 am on Saturday night. 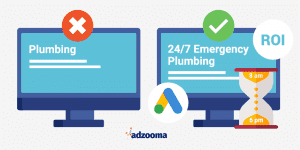 Keeping your ads scheduled in those hours will reduce wasted spend when your customers aren’t going to buy. So, you’ll improve your ROI. Offer an emergency out of hours service? Great! Use this to your advantage and schedule your ads for this exact time. After all, that’s when your customers will be looking for your service. The first one will win every time. This is because it’s more specific and tells the user that they offer emergency services, which is the exact product they’re searching for. Never make your audience work for information. Lay it out, as clear and obvious as you can. Unless you’ve got an e-commerce store that can take orders 24/7, your business might be limited by your opening times. So, it makes sense to limit your ads to when you’re open and available to help. For example, if there’s no one around to answer the phone in the middle of the night, there’s little point advertising at this time. This will prevent any customers being turned away and ensure that you get your visitors in at the right time for your business. Let’s say you’ve got a restaurant. You’re doing really well during the evening, but are struggling to pull in the lunchtime crowd. So, there’s little point running your ads in the evening. After all, you’re already doing well and the last thing you want is to turn customers away. But, if you limit your ads to the daytime, you’ll target the people that you need to up your lunchtime attendance – at the time that your business needs it. The greatest benefit of GEO-targeting ads is that they really allow you to run specific ads that 100% aimed at the right audience. If your business is limited by location – your ads should be too. Think about it. If you only work within a 10-mile radius, why on earth are you advertising to people outside of it? Your customers are going to be looking for someone that’s close to them. Someone that can come now. What’s the point of them clicking an ad for a locksmith in Scotland, if they live in London? Time-limiting and GEO-targeting limit the searches that your ad appears in. This is great if you want to increase ROI with ultra-targeted ads. But if raising awareness is more important than bringing these customers in, you’ll want your ad seen by as many eyes as possible. So, this is not the tactic you should be taking. There’s also a danger with time-limited and GEO-targeted ads that you’ll accidentally cut off a key area of your business. Before you make any decision, you need to do the research. Look at the data. Find out exactly when your customers are online and where they’re based. Use this to guide your time schedule and location radius – otherwise, you could be missing out on potential customers and sales. Ready to increase your ROI with time-limited and GEO-target ads? ‘Only advertise when your customers are online’. Because if your customers aren’t online, who are you actually advertising to? ‘Only advertise where your customers are’. Everything revolves around your customers. Absolutely everything. Put customers at the heart of your ads. Make sure they’re the audience you’re attracting and you’re on your way for PPC success. Want to see how your Google Ads is doing? Take our FREE Health Check today. Looking at all the key areas of your campaigns, we’ll provide you with a detailed review of your Google Ads account and overall score. All within 1 minute.